Here we are in week six and I’m so excited you are still hanging in! Can you believe we are halfway through this book? I hope considering it together has been a great help to you in truly absorbing the material. Point being, Frodo never dreamed being paralyzed by a venomous spider would be the way by which he was delivered to the desired end. But, in the same vein of Joseph’s’ trials, the one event that was intended to kill him served in helping him destroy the evil that originally intended it. Make sense? I’m just going to ask one mini-series of questions today because I think it is important that we give adequate thought to the fact that God isn’t simply reacting to evil perpetuated against us by figuring out a way He can later twist it to good. In fact, He is equally present in the planning stages except His intentions in that same act are for our good and His glory. I hope you are equally encouraged in knowing that Satan is never allowed to act independently of God’s goodness. I know so many things that happen to us do not seem good at all, but may we be like Joseph who was able to recognize God used the brothers to “send him to Egypt in order to preserve many lives”. Looking back, describe an event that was both intended as evil and good. Are you allowing God’s purposes to prevail or have you been content in accepting the evil consequences? Explain. One thing that really resonated with me was Joseph’s faithfulness no matter what was perpetrated against him. Are we being faithful in less than desirable situations so that God can make the most of them? How are lives being preserved as a result of your experience? Blessings on you, girls! I will enjoy reading your testimonies to God’s goodness toward you. 1. I am going to direct everyone to something I posted last year. ( http://heart-of-service.blogspot.com/2008/08/arresting-afternoon.html ) If you’ve been reading my blog for a while, you will recall this story. It was an emotionally draining situation, and it could have turned out so differently. In that particular case, I was able to see how God used the situation to grow me spiritually. I think that so many events in our lives are simply vehicles for God to teach us something about His character…just, holy, loving, faithful, jealous, righteous. In my case, He used something that only affected me indirectly to show me my own sinful behavior. It could have gone either way. I could have become even more bitter towards the people who had wronged my husband, or I could have taken the chance to reflect on the state of my own heart. Thankfully, by the guidance of the Holy Spirit I was able to accept the chastening for what it was…an opportunity to grow. 2. When I read this question, I thought immediately of my children. My example in times of great trouble or difficulty goes beyond what I am learning, but has a permanent and lasting effect on the lives of my children. Do I want them to face adversity with a willing spirit, leaning on the strength of Jesus Christ, or do I want them to face it with bitterness and anger? I think they learn so much more about real faithfulness when they see me react once with grace and mercy in a difficult situation, than if I were to be gracious and merciful 10 times over during the good times. I pray that my faithfulness will preserve their lives in an eternal way, by being the example that leads them to a relationship with Christ. Wow! I can’t believe it’s already week 7! Great post, Lisa!! I so wish I had gotten the book in time to start this study with you all! It looks awesome! Thanks for sharing what God is teaching you. You are such a blessing to me!! I love that one. Thanks for the encouragement. I’ll be back later to post my comments…I need to think about it a little more first. But in the meantime, I posted summary notes of chapter 6 here. 1. Wow. I have been thinking about this one all day, which is why it has taken me a while to get my post up. My life thus far has been blessed by not experiencing deep, wrenching heartache or evil on the scale that many folks encounter. I haven’t been able to think of a “major event.” But there have been numerous times when I considered an occurrence to be counter to what I presumed was God’s will, only to find out later that He had a much better purpose after all, and I was oh-so-grateful my plans did not succeed. Oh may all who come behind us find us faithful! Like Xandra, I think it’s probably better to link to the description of this event in my life (I’d take up way too much space here!). In short, nearly losing a child was something I believe the enemy was hoping would destroy my faith and my testimony, but instead, the Lord intended to use it to not only draw me into deeper fellowship with Himself, but also to serve as a testimony of His faithfulness for others. As a result of the internet, people all over the world were praying for my little girl… and reading my online journal (before the world of blogging really took off). Through the entries there, they were able to experience every setback, every miracle, every answered prayer… and also be witness to the transformation the Lord was working in my own heart. I believe Christ was glorified as a result of the tragedy that struck our family… and Satan was defeated. It did nothing to shake my faith, as he probably intended, but instead it deepened my understanding of my Father, and established my faith upon the firm foundation of the Rock of my salvation. Praise be to Jesus! Oh how I hope this is true of me, but I know that it isn’t always. We are constantly being watched… our children are watching, for sure, and learning from us… but unbelievers are also watching. They want to see what happens when our world is shaken to the core. Will we grasp tightly to the hope we have in Christ, or will it disintegrate into ashes before their eyes? Will difficult times provoke us to lashing out at others, or will the fruit of the Spirit be evident in our lives? Will we continue to praise Him with our lips as He allows catastrophe to crash into our world… or will we fall and forsake Him? They want to know if we’re for real… and there’s nothing that tests the purity of metal like a fiery inferno. Father, may I be found clinging to You with all that I am… leaning my full weight upon You, whether in good times or in bad. Make it so in my life! But there are more thoughts (and a great song the Lord put before me at the same time as I was reading this)posted on my blog… (http://bellissimanh.wordpress.com/2009/03/02/spectacular-sins-the-sale-of-joseph-the-son-of-god/). I am amazed at how He puts pieces together… a beautiful puzzle with each piece fitting perfectly with the next. Hello, this is my first visit to your blog. I love it! I just watched your video greeting and had to laugh. =) Your so funny! I love how your kids were there and it was so real! Anyway, i just wanted to say hello and that i’m looking forward to reading more of your blog. The sermon on Joseph is there as well. I wish I had known you guys were doing this book. I think I’m going to blog about what the intended evil in my early life, GOD worked for HIS good purpose and glory – and praise HIM…my salvation! Way back in time, I was married to a man who I thought I would be with forever and ever. But he had an early mid-life crisis coupled with a high school reunion, which led him to ignite a flame with one of his classmates. 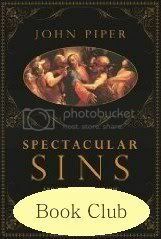 Their “spectacular” sin (although “spectacular” isn’t how I would have labeled it!) led to the dissolution of our marriage. I was devastated and mourned for quite awhile. But over time, God led me to a greater dependence on Him through that situation, and after several new struggles in being a newly single first-time mother, I finally arrived at a place of contentment again. It was then that God brought my now-husband into the picture. This man demonstrated the love of Christ to me right before my very eyes, in a way I had never seen or experienced before. Because of my relationship to him, I’ve been freed in spirit to love the Lord in even deeper ways than I ever would have thought imaginable. Now for my disclaimer :-)…I have heard some friends wish that their husbands would commit adultery so they could be freed “by the letter of the law” to get out of the marriage and start over. I strongly oppose that and feel that is NOT the way to freedom at all. Yes, God can use sins to bring about his plan, but we’re not supposed to be WISHING for the sin to happen. 2. Am I being faithful in a less than desirable situation? I’m trying to be. My husband has been traveling with work so much lately (a very undesirable situation), but my prayer is that I can be supportive of him during this time instead of whining about any extra workload that lands on me. I don’t always succeed, but when I listen to the Holy Spirit and act accordingly, the quality of life goes up for everybody around me. This chapter has been difficult for me because I am caught in a situation at the moment that I can see so clearly that Satan intends for eveil and I’m desperate to see how God will use it for good. I cannot give details as that would fan the flames of gossip which are rampant. But I have been encouraged over and over by people who know nothing of the situation reminding us over the last two weeks that “when you are seeking God’s way, Satan will attack.” We are trying to see this as confirmation that God is indeed at work and attempting to remain faithful in the meantime. What a timely chapter for me! Xandra, Heather and Lisa thank you for sharing specific incidents with us of seeing the good come out of the evil. All three of your stories touched me and encouraged me. Blessings to each of you! Oh, I hate being behind! These are some great (and honest) testimonies–y’all have encouraged and challenged me. I hope to have my post up tomorrow! I’m not doing this study with you, but I’m teaching on Joseph next week, and God has used these insights to bless me greatly! Thanks to everyone for sharing! I have been putting off commenting on this, as I feel like I could write a book. Joseph’s story is very dear to me; God used it in such a profound way in my life a few years ago. At the time, I was in the midst of an agonizing situation. My life had been completely torn apart by events outside of my control, and since it was all very private, I was left to work it out with God alone. But God, gracious in mercy and abounding in love, walked with me through the fire. And ultimately, I saw His fingerprints on even the worst of circumstances. He allowed evil and pain so He could build faith in me and bring glory to Himself. I believe (pistis) this with all my heart. I have tasted it and seen it. It’s exhilerating to know that NOTHING — not even evil — is out of His control. Joseph would surely echo that if he could speak today. It is a very comforting truth to me. I have been through several major illnesses and/or injuries that were hard to walk through….actually, one was impossible to “walk” through as I spent 9 months in a wheelchair that year:)…but, each one lead to my spiritual growth and to compassion for others in ways that I could not have known otherwise. However, it still took seeking the Lord through each circumstance to “grow” and be truly able to say and mean “God meant it for good”. I think that it is harder to be faithful in the smaller less than desirable situations (maybe because I don’t do the same seeking). I am more likely to grumble and complain when dealing with the smaller issues than when going through major tragedies. It is easy to forget that God is in the minor inconveniences, as well.